Quite a while ago, I was wondering when Gigabyte would update their i-RAM solid-state drive. 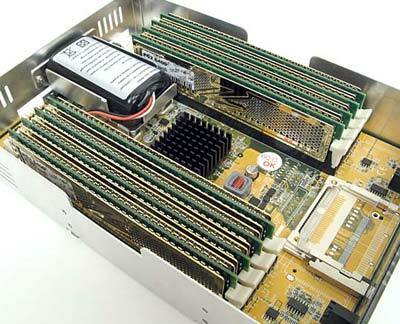 The i-RAM turns ordinary memory modules into what looks to the computer like a SATA hard drive, except faster. For some tasks, way, way faster. Well, Gigabyte haven't made a bigger, better, faster, cheaper i-RAM yet, but I am indebted to a reader for the knowledge that another outfit has. And to The Tech Report for their excellent review of this new SSD, the ACard ANS-9010. The ANS-9010 has lots of great features, including a couple of unexpected ones. It uses dirt cheap DDR2 RAM (preferably ECC; if you use non-ECC RAM, the drive will use a ninth of the memory capacity to do its own error detection and correction). It has eight memory slots so you can populate it up to 16Gb quite cheaply (maximum capacity: 64Gb). And it also, of course, has a backup battery, so you won't lose data if you turn the computer off. The ANS-9010 also has two SATA sockets on the back. It can pretend to be two drives, so you can plug it into a RAID controller and make a two-drive stripe-set for even faster transfer rates. The only problem with the ANS-9010 is that it lists for $US400, empty, and doesn't seem to have a significantly lower street price. So even if you've got eight 2Gb DDR2 modules just sitting around and so can populate an ANS-9010 to a good-enough-for-a-boot-drive 16Gb for free, it'll still cost you an easy 1.5 times as much as a 300Gb Western Digital VelociRaptor. The ACard drive's seek speed will beat any moving-parts drive by a mile, but in most other tests the VelociRaptor will at least be even with the SSD - and it's got tons more capacity. And then there are Flash-RAM SSDs. When the i-RAM came out, it was very expensive per gigabyte, but it had no real competition. There were no other solid-state drives on the consumer market then, if you didn't count slow memory cards in cheap PATA or SATA adapters. But now, computer stores all have several flash-RAM SSDs on the shelves. And $US400 will buy you a lot more than 16Gb of SSD capacity. If you populate the ACard drive to 32Gb you'll be paying as much as you would for a 64Gb SSD with an SLC controller. The Tech Report review compared the ANS-9010 with various moving-parts drives, including a VelociRaptor. But their comparison also included an i-RAM, a couple of cheaper Flash SSDs, and an Intel X25-E Extreme Flash SSD (which they'd reviewed before). A "32Gb" X25-E (real formatted capacity 29.7 gibibytes) will set you back about $US600, which is also about what it'll cost you to buy an ANS-9010 ($US400) plus eight brand-name 2Gb DDR2 modules, at current prices. The ANS-9010 edged out the X25-E for most tests, but the difference was almost always too small to be noticeable. And for a few real-world tests, like system boot time, the fancy SSDs lost to boring old hard drives! The ANS-9010 did really well in the IOMeter test, but that's irrelevant to people with normal PCs, because it measures how well a drive can handle multiple users in a server application. Old-style ultra-expensive solid-state drives often ended up doing this sort of thing, and it's great to see that there's now a good option for people who want that sort of server but aren't made of money. For the tasks that people do with everyday PCs, though, IOMeter tests mean nothing. So I suppose the shifting sands of the computer market have claimed another product. Us dorks were all waiting for an improved i-RAM, and now it's finally come along, and it's exactly what we wanted. But we might as well just get a little Flash SSD, or a VelociRaptor, which'll give us more drive capacity and about the same performance. I hate finding out what I think I want isn't really what I need. I can't think of a better way to spend Australia Day either. You can buy several SSDs and a dedicated RAID card to help smooth the caching issues that cheaper SSD get with random writes, for less than a populated iRAM drive, and get similar/faster performance, without the need for CF backups and external power, and roughly twice the storage capacity for the same price. Recently, the guys at the OCZ Support formums have also discovered that correct "alignment" of partitions for SSDs specifally will eliminate these stuttering issues that were found a while ago. I tested two of these things over a month – the single-SATA one is no faster than an SSD for reads, although it's usually 50% faster for writes. I could not get transfer rates in excess of 300mb/sec with the RAID version, which is easily achievable with SSD+RAID card. The unit got quite hot due to its power consumption. They use 12v so can't steal power from the PCI slot or HDD leads when the PC is off – I suggested to them that they should provide an ATX 24-pin power passthrough cable with 12v parasite lead, as the USB VFDs in Zalman/Silverstone cases do, instead of a power adapter. The RAID option would only work if the power adapter was connected. Seemed to be a bit of a beta product tome, as it had 3 firmware revisions in 6 weeks, none of which cured the issues I had with it. What good is a passthrough lead with a 12v connection gonna do? When the PC's shut down, the only thing it can deliver is 5v, and then only an amp or two worth. The only advantage it'd have would be Less Power Cable Mess. Its feature set seems tailor-made for swap and scratch-disk work. I suppose if you make a habit of manipulating multiple gigantic files at once then this gives you a way to have virtual memory that's pretty fast beyond your maxed-out RAM slots.